There were once nineteen windmills built on the city walls of Leiden but only De Valk is still standing today. The present mill has had two predecessors. In 1611, the post mill 'De Valck' was built upon the Valkenburger bulwark and later made way for a wooden tower mill in 1667. In 1743, the city council granted permission for the construction of an even taller tower mill but this time made of stone. This is the current 29-metre high mill known as 'De Valk', the body of which took only three months to build. In 1869, following numerous changes of owner during the preceding years, the mill was purchased by Pieter van Rhijn (1848-1889), descendant of a prominent family of millers in South Holland. The dwellings inside the mill were converted into one large house, the interior of which has been preserved and can still be seen today. In contrast to many other mill companies, De Valk's business was so successful that grain often had to be ground at night in order to meet the customers' demands. Following the death of Pieter van Rhijn, his widow Jacobina Aleyda Schippers (1848-1932) continued the business, initially with a few labourers and later with their son Willem. 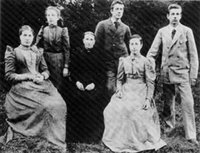 There were four other children besides Willem - Clasina, Bartha Johanna, Joannes and Elisabeth Mariane. Willem followed a course in milling from 1897 and took over the management of the company in 1911. In addition to his work at the mill, Willem was also very interested in genealogy, which is reflected in the many portraits of family members and various family coats of arms hanging inside the mill. He also researched a possible family relationship with the miller's family Van Rhijn to which Rembrandt belonged but, much to Willem's disappointment, there was no evidence to support this theory.